And that’s never more true than when you are struggling to slog through that first draft – when the stunning, riveting, gut-wrenching scenes that have electrified your imagination are slopping out onto the page with all the charm and intensity of room-temperature mayonnaise. Everyone says ‘just keep writing!’ – but that’s a tall order when you’re staring down a blinking cursor in the midst of what feels like a hopeless hot mess. Let Tex Thompson help rekindle your creativity and get you back on track! 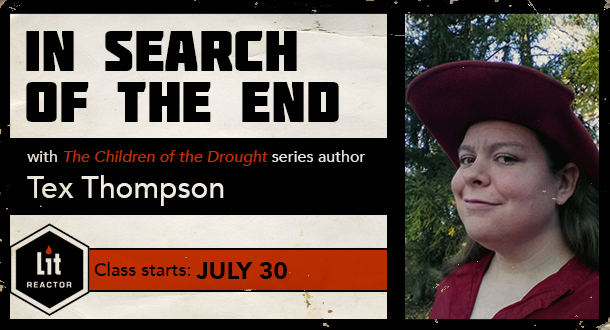 Tex is the author of the Children of the Drought series – an internationally-published epic fantasy Western. She has a Masters in Literature, and is an instructor for the Writers Path at Southern Methodist University in Dallas. She is also the founder / ‘chief instigator’ of WORD (Writers Organizations ‘Round Dallas). When she's not writing/teaching/instigating she's blazing a trail through writers conferences, workshops, and fan conventions around the country, sharing her knowledge and love of writing. She truly is a one-woman stampede. In this class, you and Tex will take a deep dive into your work-in-progress manuscript to discover the heart of your story. She'll read everything you have so far (whether it’s 700 words or 70,000!) and then set up a time to have a real one-on-one phone or Skype call to help you problem-solve. You’ll also work through weekly ‘troubleshooting’ lessons designed to address the most common first-draft issues – so that you finish with all the confidence and enthusiasm you need to right your ship and earn your happy (author’s!) ending. This week is all about drilling down to the essence of your story – understanding what about it motivates and excites you, taking best possible advantage of your creative strengths, and developing strategies for tackling your weaknesses. NOTE: You will be required to submit your work-in-progress manuscript to Tex no later than JULY 23rd (a week prior to the start of the class) so that your one-on-one can be scheduled for the first week. In the second week, we dig into your key character(s). Are you challenging them appropriately throughout the story, and will those conflicts continue to develop in interesting ways? In week three, we’re looking specifically at cause and effect, and how to ensure that every scene builds on the ones before it. This is how we create tight, dynamic story structure! Our final session is all about making sure you have a realistic plan for keeping your momentum and overcoming future obstacles. This includes both productivity / time-management strategies and problem-solving techniques for writing yourself out of a corner. "I've said it before and I'll say it again: Thompson is an editorial bomb cyclone and whatever you write will be better for her eyes having beheld it." "Tex has such enthusiasm and knowledge...It was a fantastic class and I will definitely apply [what I learned] to my writing." "A talk with Tex was just what I needed. It was both humbling and helpful. Everyone needs a Tex Talk." "My fairy godmother sat me down and taught me how to sew my own damn dress. Thank you, Tex. It's gonna be lovely." “This author can really write. If you loved Stephen King’s Dark Tower series – or even if you’re a hardened Cormac McCarthy fan – you will find this book right inside your wheelhouse. Living, witty dialogue, and a familiar-yet-strange world inhabited by vivid characters. I loved it."